What to do? Please help! Remember this fabric I was thrilled by? I thought about how to use it for several weeks and finally decided on Turning Twenty Again. It’s an old pattern, but I’ve seen it made up in many different fabrics and it’s almost always spectacular and modern-looking. The fabric I bought was 8 fat quarters, and Turning Twenty Again is a pattern developed for efficient use of fat quarters, so it seemed a good match. 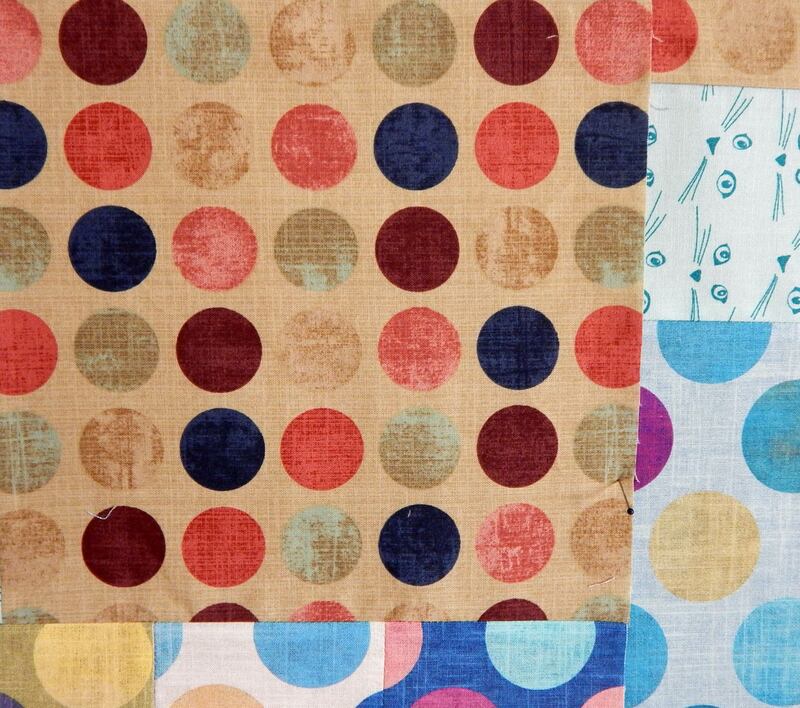 I needed a little more fabric and found this dot in my stash–it had the same appearance of linen texture as the original fabric and I thought it went perfectly with the others. The next question was what else to add. 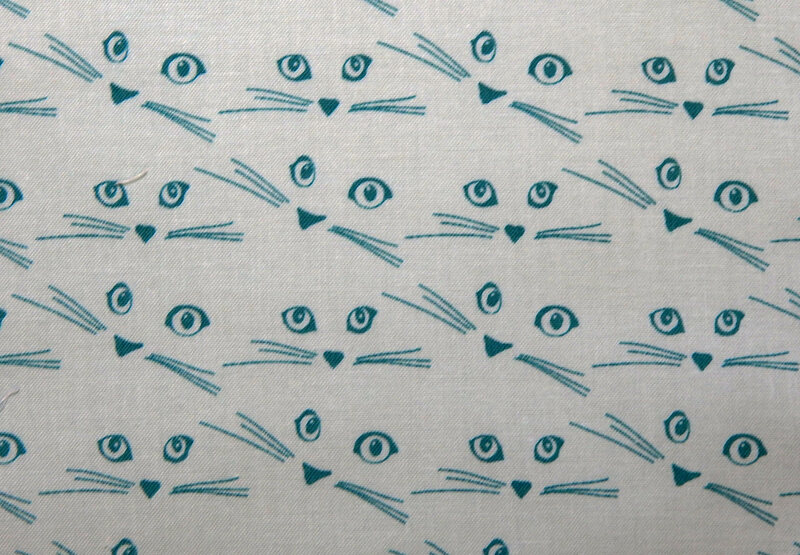 After auditioning several options, I decided on this cat fabric. The eyes are sort of of dots, too, and the color coordinated well. I made the blocks and put them on the design wall, and… Eek! Is it too busy? And when I see it overall, I do not like the tan fabric I added, even though it is similar to the beige-green that came with the fat quarter set! I’ve had it on the design wall for a week trying to decide what to do. 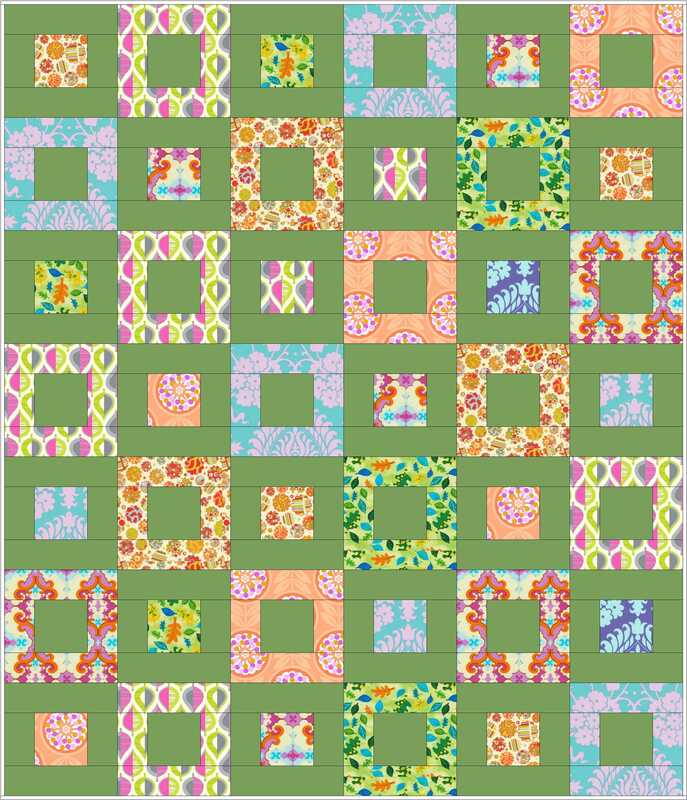 One option is to put the squares together with sashing and a border to kind of calm things down. I auditioned a dark blue fabric and a turquoise fabric for that–both are Moda grunge, so they have the same linen-look texture. Another option is to take the blocks apart in order to add these birds from the same collection, giving a greater variety of prints. I think if I take it apart, I will remove the tan fabric I don’t like, so the birds could add variety AND get rid of the tan! From there we go into the wild options. They are legion, and include the possibility of cutting the blocks randomly and inserting solid strips. Or I could replace some pieces with the birds and some with the turquoise grunge. And of course there is the perennial option of putting it away for a month and then looking at it again to see what comes to mind. Since somebody has to be in charge of guild programs, and this year I’m “it” for my modern guild, I’ve been publishing some ideas for guild programs and challenges. Hopefully, if you are in charge of programs and challenges for your guild, you can use some of these. 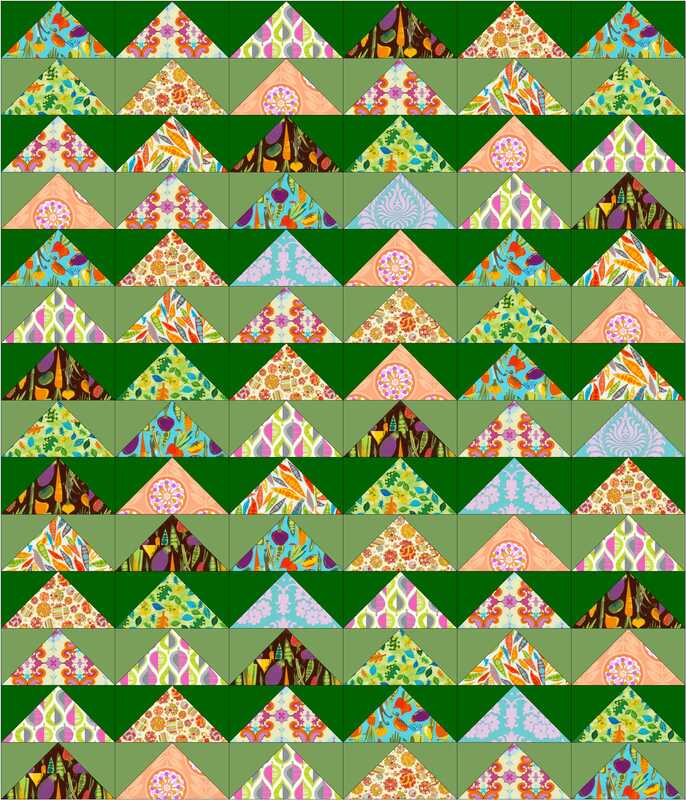 And if you decide to develop a program on tessellations for your guild, feel free to e-mail me. You can have my “class outline” and list of exercises if you want. 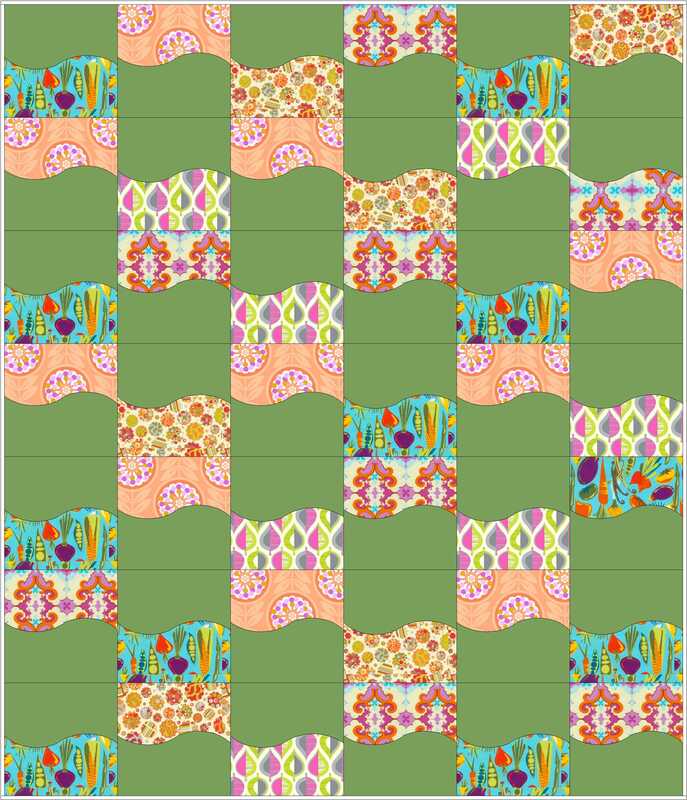 The challenge for next month is to make a 12-1/2 inch (so it will finish 12 inches) wonky house block. I made up a couple of blocks to illustrate the idea and drew a couple of additional ones for people to take home for inspiration. We’ll vote on whether to have a “dirty Santa” swap or a drawing where one person gets all the blocks to make a quilt. Seems like most of our members are really into the swap thing, so I’m betting that’s what happens! YOW! 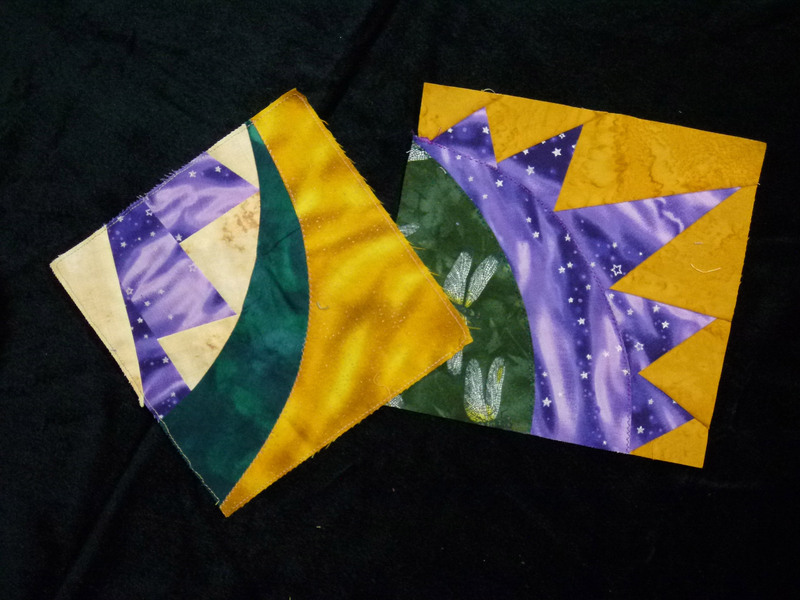 I’m teaching curved piecing! The class is at Studio Stitch in Greensboro (NC), one of my favorite shops. 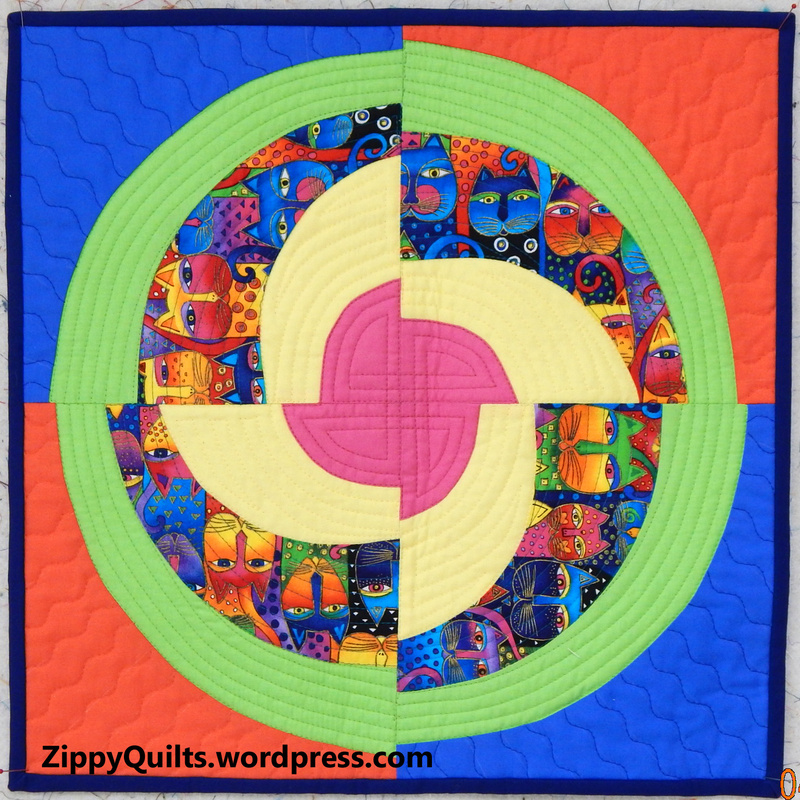 To my surprise, I don’t have a picture of the quilt I’m using as a class sample, so I had to lift this one from the Studio Stitch website. 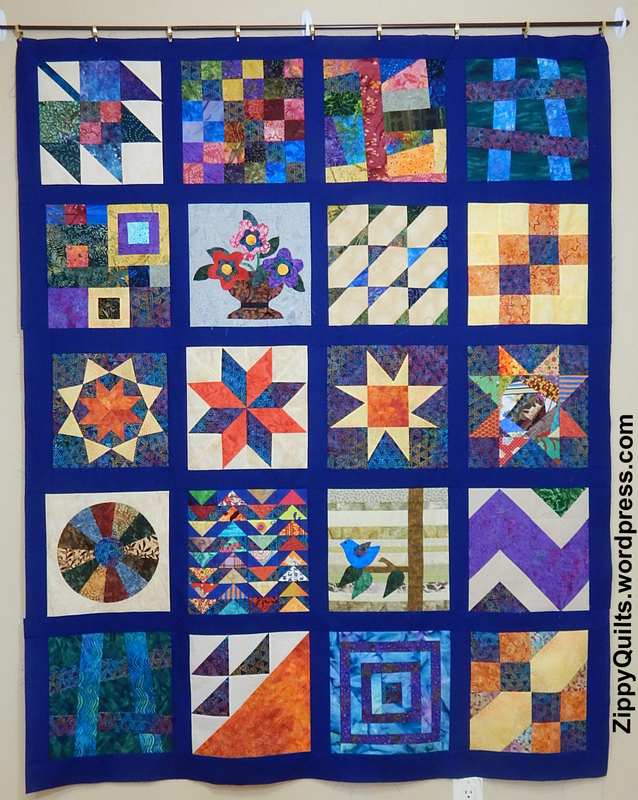 There is no pattern for this quilt; it is just what I did with some really bright batiks and some nice templates from Elisa’s Backporch Designs. I’m going to teach at least 3 different ways to piece these curves, so most anybody with some sewing experience can find success with at least one of the methods. 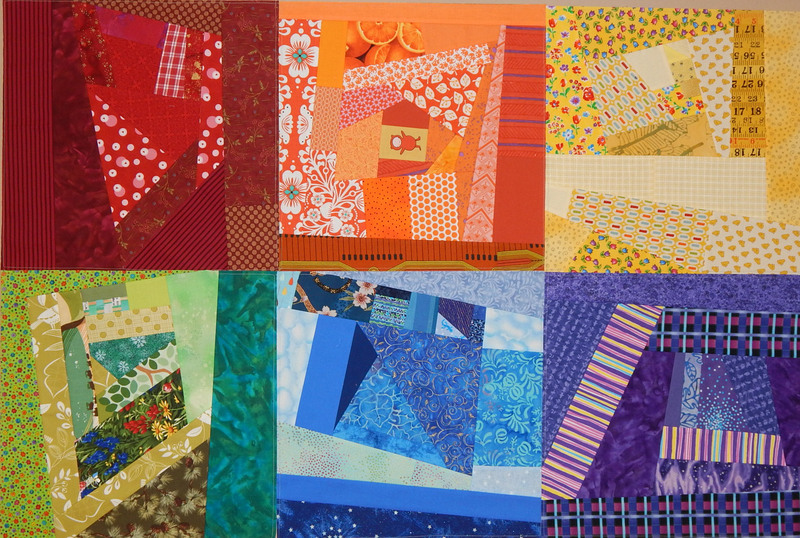 I got out some examples of my quilts with curved piecing yesterday to have them for display in class, and I was surprised at how many there are. 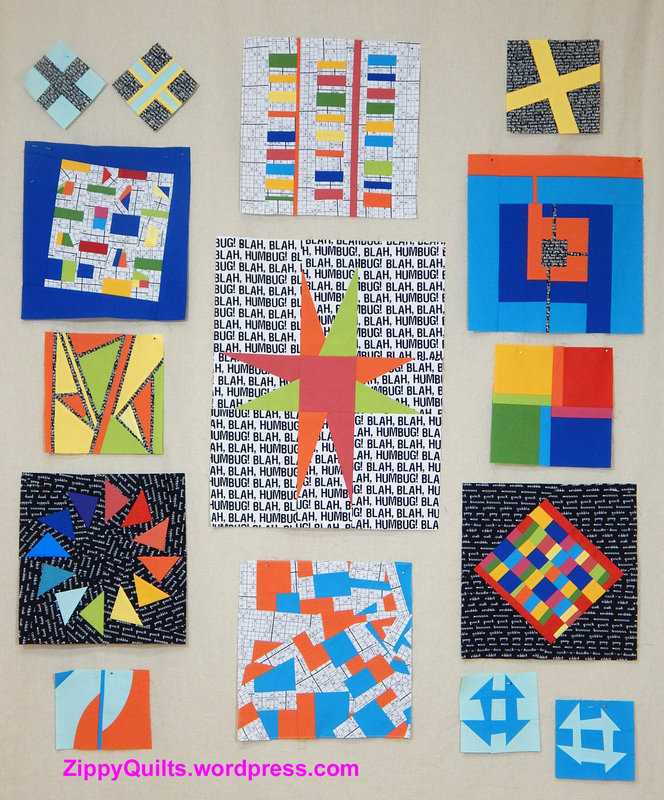 Then I found all these pictures of other things I’ve made with curved piecing, so here are a few. This was made using the Quick Curve ruler. I don’t love it–but the baby did. I thought it might be helpful to other modern guilds if I posted our proposed challenges, since I’m sure other folks are in need of ideas, too. So here’s the first one: slabs. 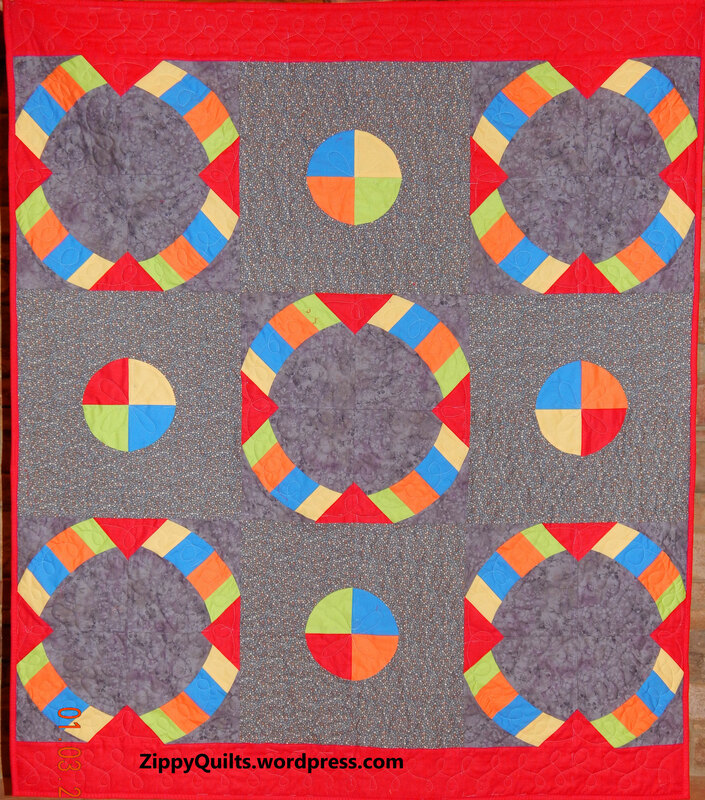 If you don’t know what a slab quilt block is, Canadian quilter Cheryl Arkison published the idea in her book Sunday Morning Quilts. You can see a picture and instructions here. Slabs can be addictive! 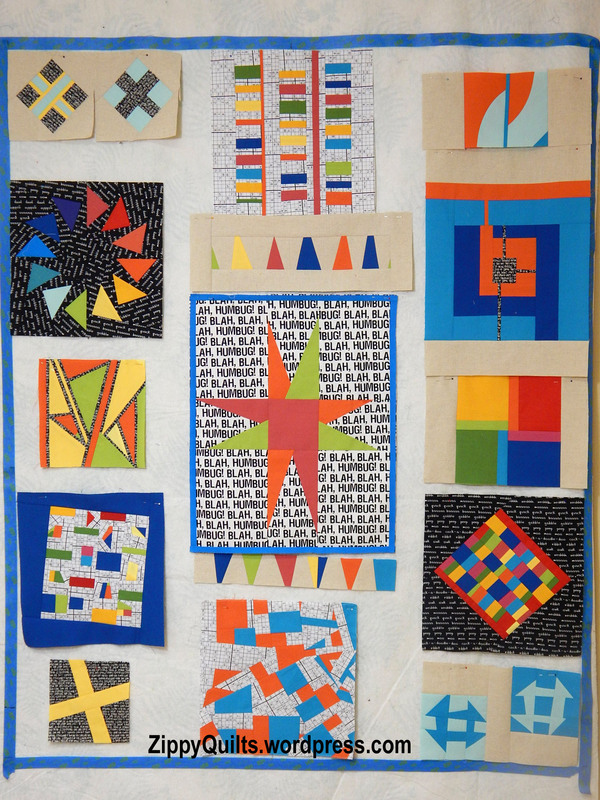 And a quilt of many colors is fun. It is customary to list indigo as a color lying between blue and violet, but it has never seemed to me that indigo is worth the dignity of being considered a separate color. To my eyes it seems merely deep blue. So our colors for the challenge are red, orange, yellow, green, blue, purple. Seems like the main value of indigo and violet is that they let us spell out ROY G BIV. Huh. Our slabs are 15-1/2 inches square, to be 15 inch finished blocks. 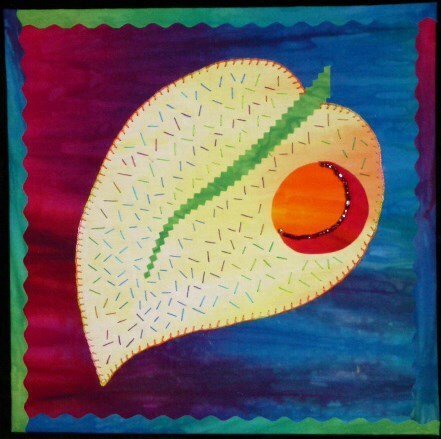 Each person makes one in her assigned color, then can make as many others as she wants in as many of the six basic colors as she wants. At the next meeting, we’ll put all our slabs in a pile and each person’s name will go in a basket once for each block she turns in. Then we’ll draw a name and somebody gets all the blocks. Of course she’s expected to make something wonderful with those blocks before the next meeting! 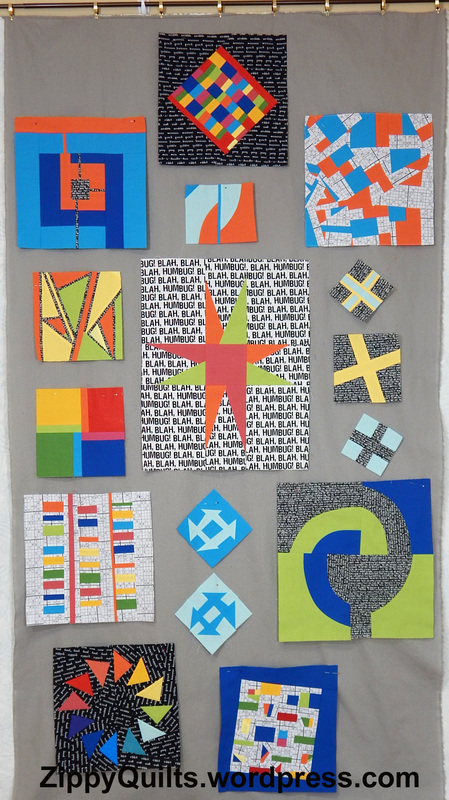 I e-mailed examples of slab quilts to guild members as part of the challenge and also took some of my quilts to show. Does your modern guild have some great challenge ideas? Let me know! I’ll be posting about our other challenges as we go along so you can use them, too. 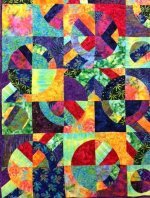 Cheryl Arkison is one of several people to suggest putting together scraps of the same color to make a quilt block (or fabric from which to cut quilt pieces). 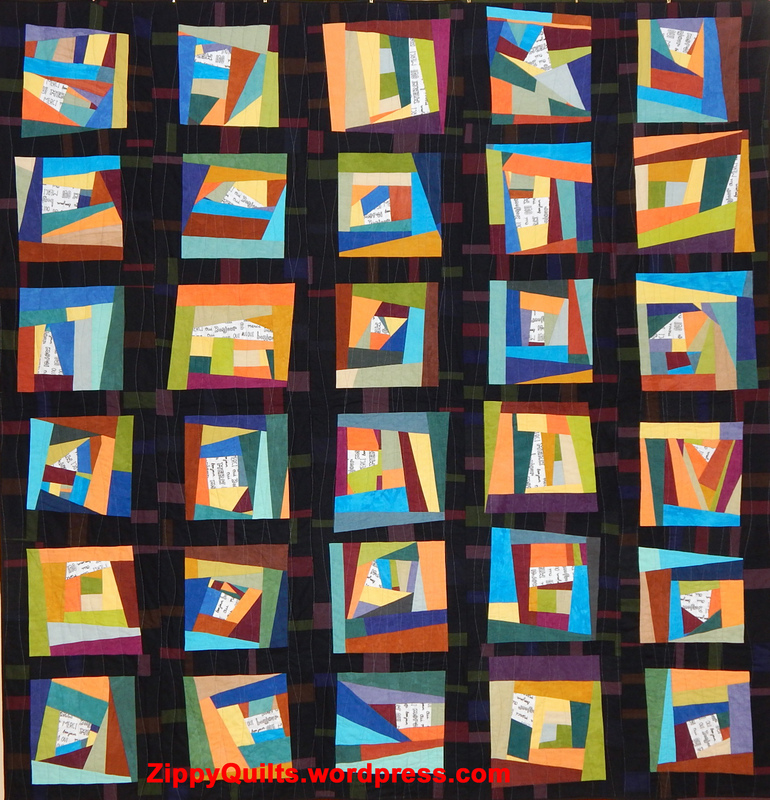 Cheryl calls hers “slabs” and makes them big–15 inches square finished. 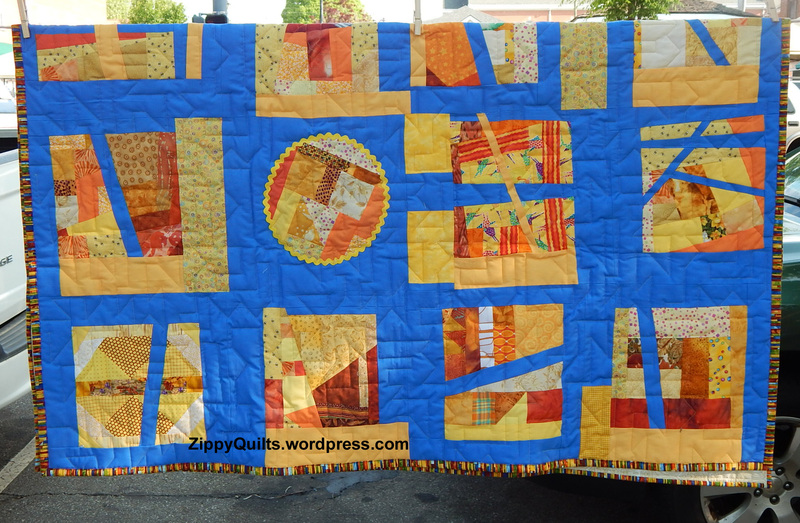 Above is the quilt I made from a slab swap with one of my quilt groups a couple of years ago. I had asked for slabs made from the yellow/orange family, and I loved what I got. 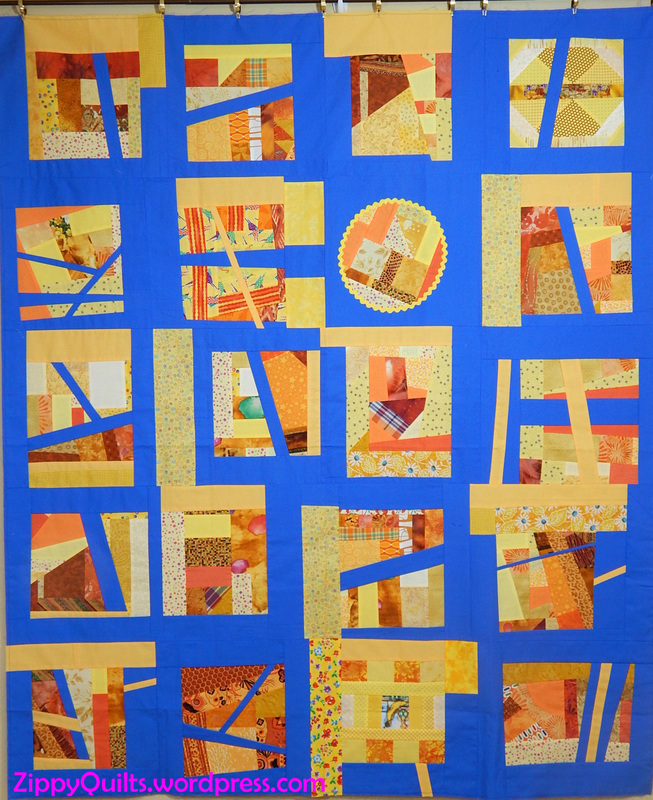 But I’m not one to leave well enough alone, so I cut them up and made the quilt shown above. 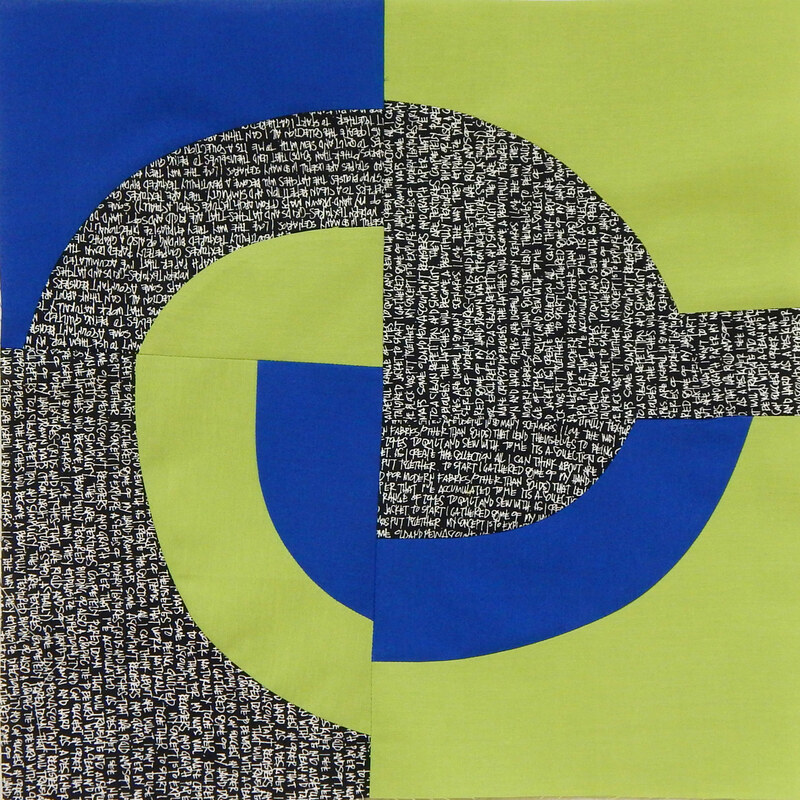 A relative-who-will-remain-nameless looked through my quilts online and asked for something similar, but in a larger size. I’ve had fun collecting orange and yellow fabrics. My friend Linda donated a large bag of orange “scraps”; I felt free to ask her since she claims to hate orange 😀 Then she brought me a big cut of solid orange to go with the scraps! 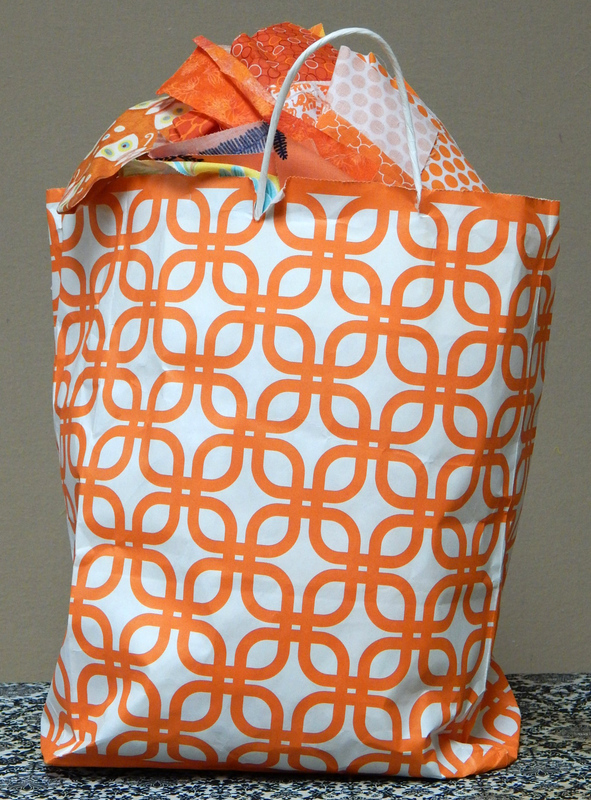 Linda even found an orange patterned bag to put her scraps in! The rest came from my stash and from a few things I bought while travelling. 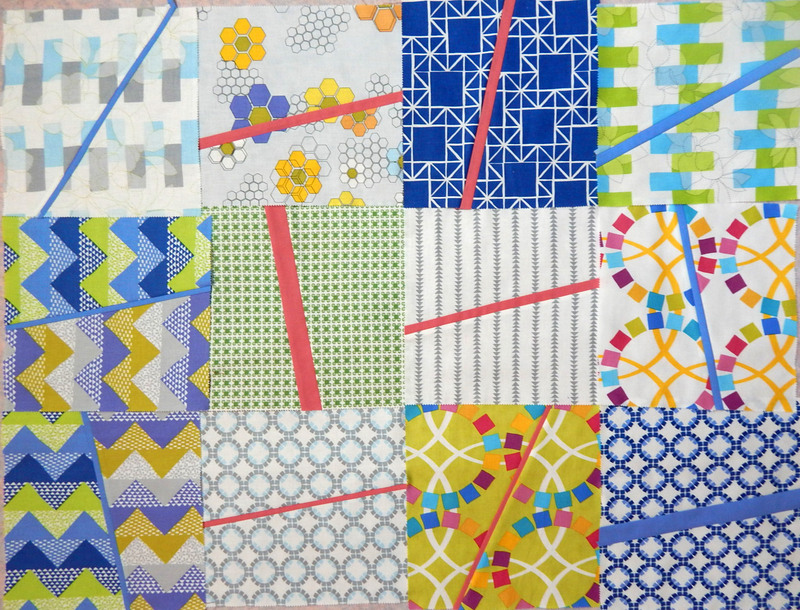 I improvised the squares, featuring a few funky fabrics in each one from the fabrics I bought especially for this quilt. Then I used Moda Bella Amelia Blue to sash each square and cut the sashing so they are all wonky. 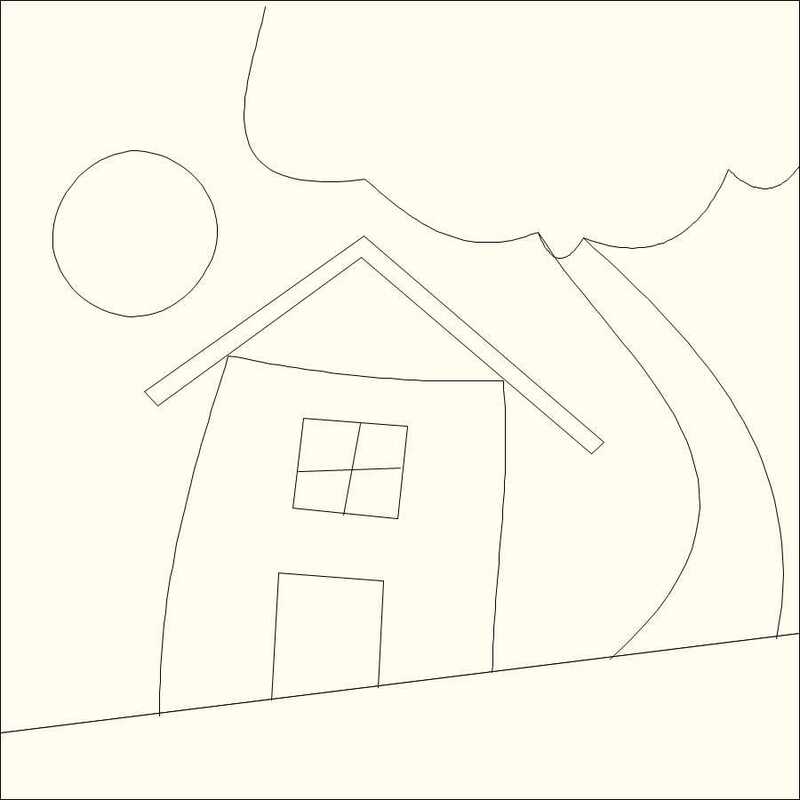 Each will finish 18″ square with sashing. This one will be big enough that it will need to go to the long-arm quilter. I’ll have more pictures when it’s finished. Meanwhile, how are those holiday projects coming along? 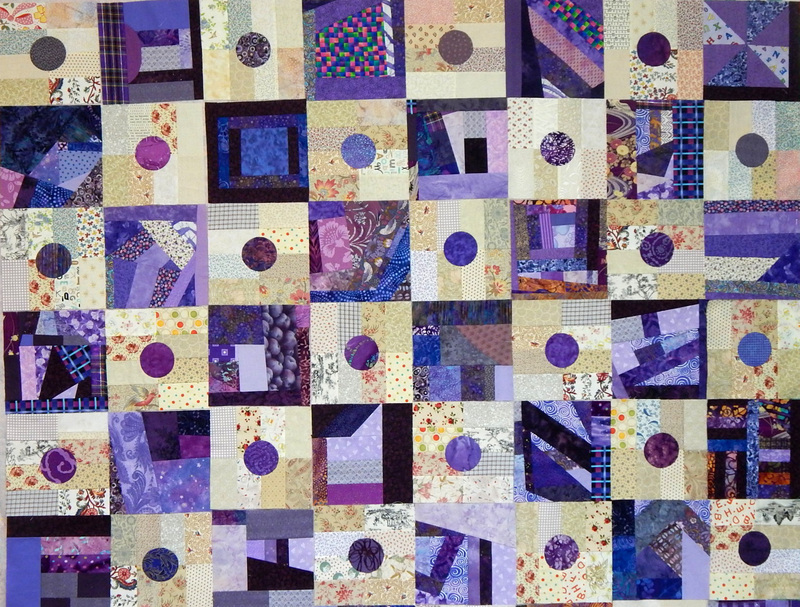 This quilt was started about 2 years ago when I bought a scrap pack of Cherrywood hand dyed fabrics. 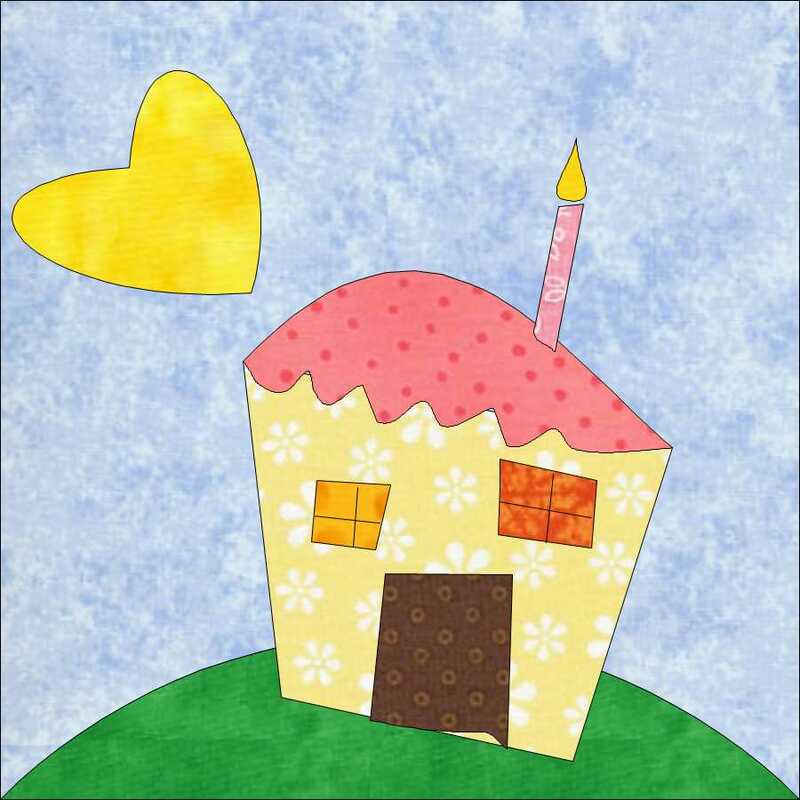 The blocks are entirely from Cherrywood scrap packs plus that cute print with the words on it, which is a Robert Kaufman fabric. The dark sashing is made from black plus little pieces of the darkest almost-black solids I could find. All are Cotton Couture from Michael Miller. 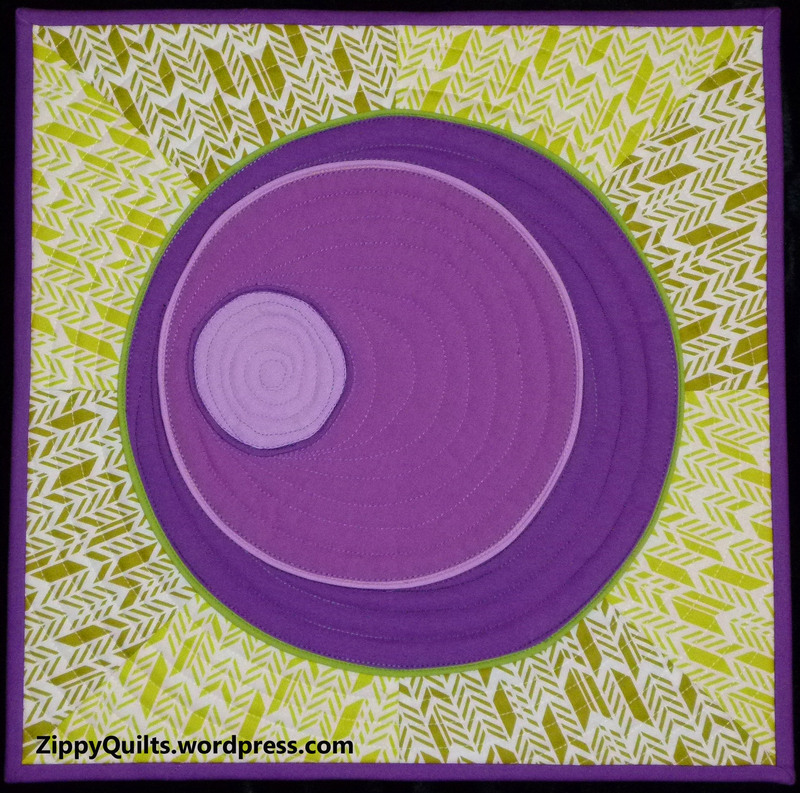 I quilted this on my home machine, using randomly-spaced, gently curving, lines from edge to edge. I used Superior Bottom Line in the bobbin, which I always do. Top thread is a medium grey light weight polyester, Mettler Metrosene. 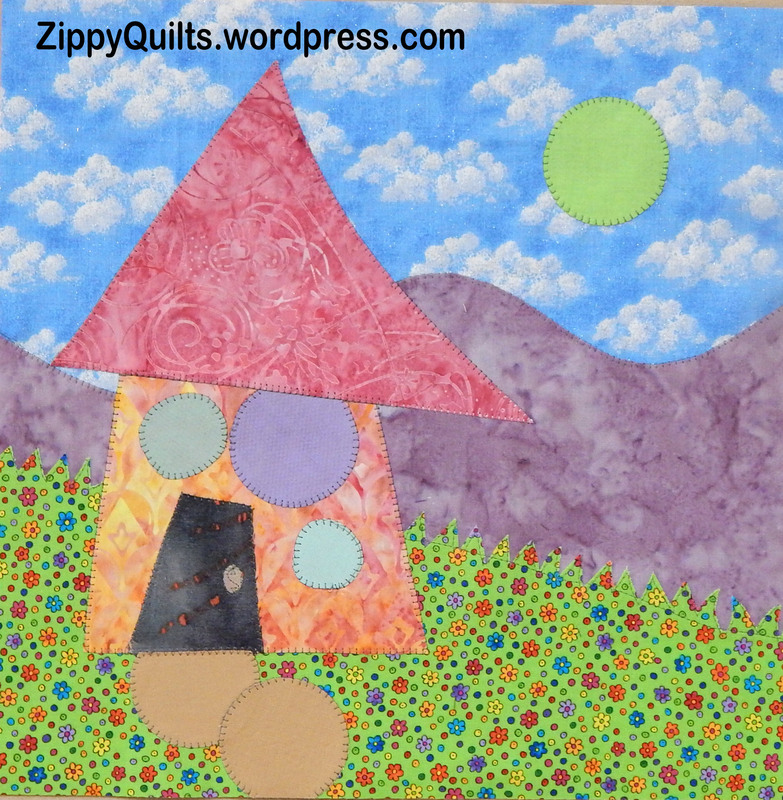 This is going to the Smoky Mountain Quilters show in September. This year the show is scheduled in conjunction with Western Carolina University’s Mountain Heritage Day, which I think is a great idea. Of course I’ll have pictures from that show when it happens. Linking to Aunt Marti’s UFO Challenge. I did get one finished this month! I bought a terrific layer cake was bought a couple of years ago and it has been “waiting”, along with its solid coordinates, for inspiration to strike. 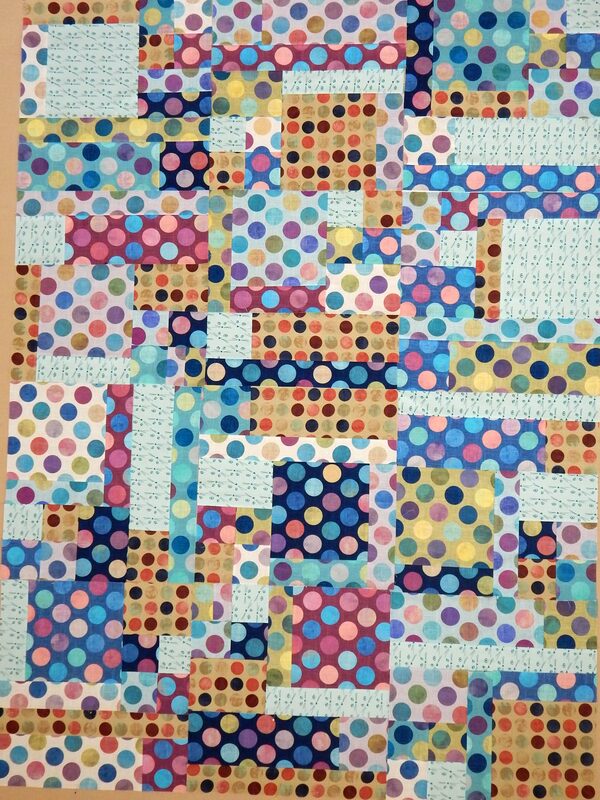 Then the other day I decided I wanted to insert strips of the coordinating colors into the squares. 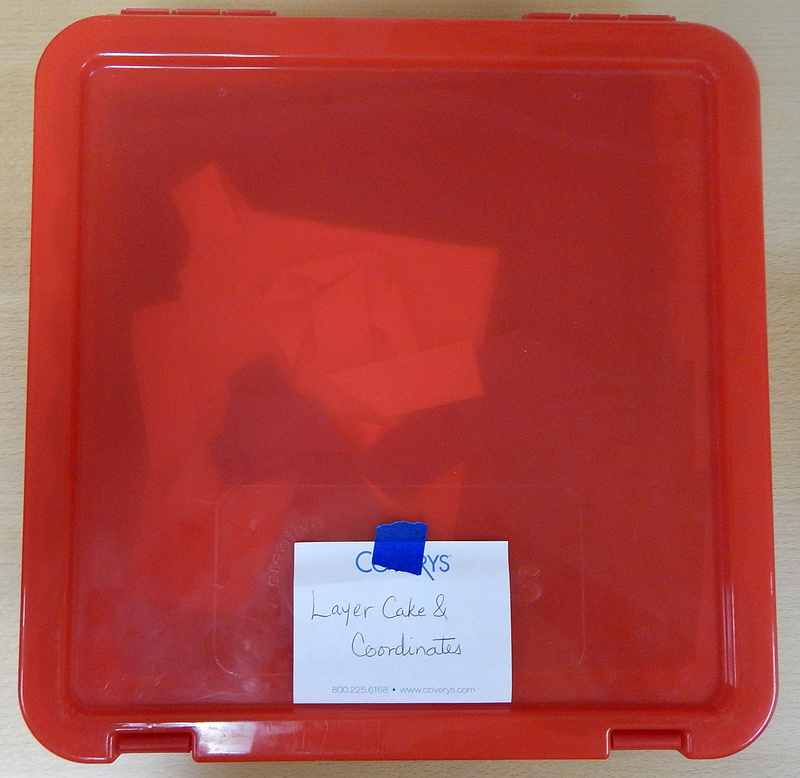 As you probably know, a layer cake is a stack of 10″ x 10″ squares. 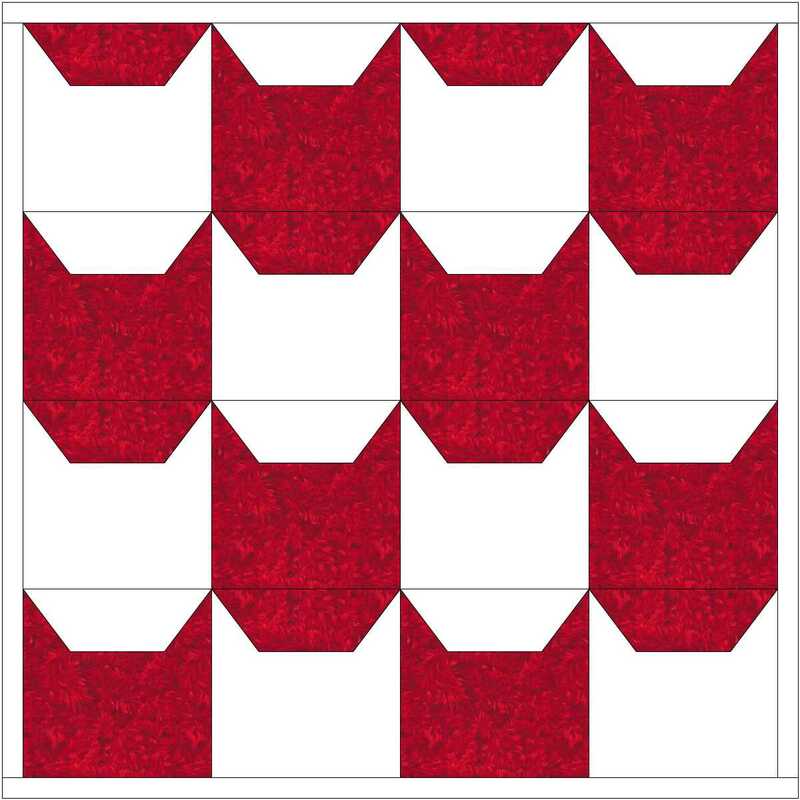 That means fat quarters (18″ x 22″) of solids will work well for insert strips. I started by sorting the layer cake squares into stacks with the solids I wanted to use with them. 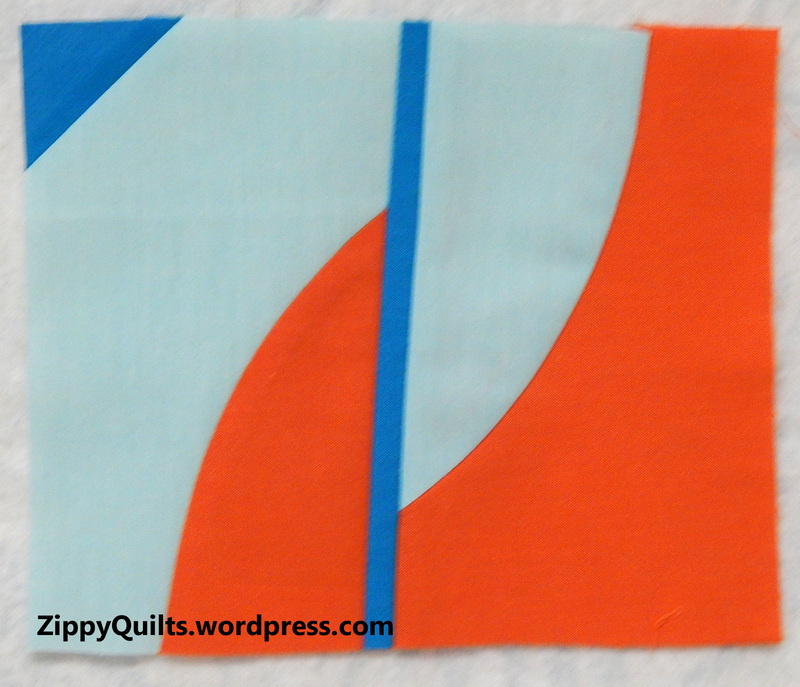 Then I cut strips of various widths from the solids.The strips varied from 1″ x 18″ to 2″ x 18″, in 1/4″ increments. 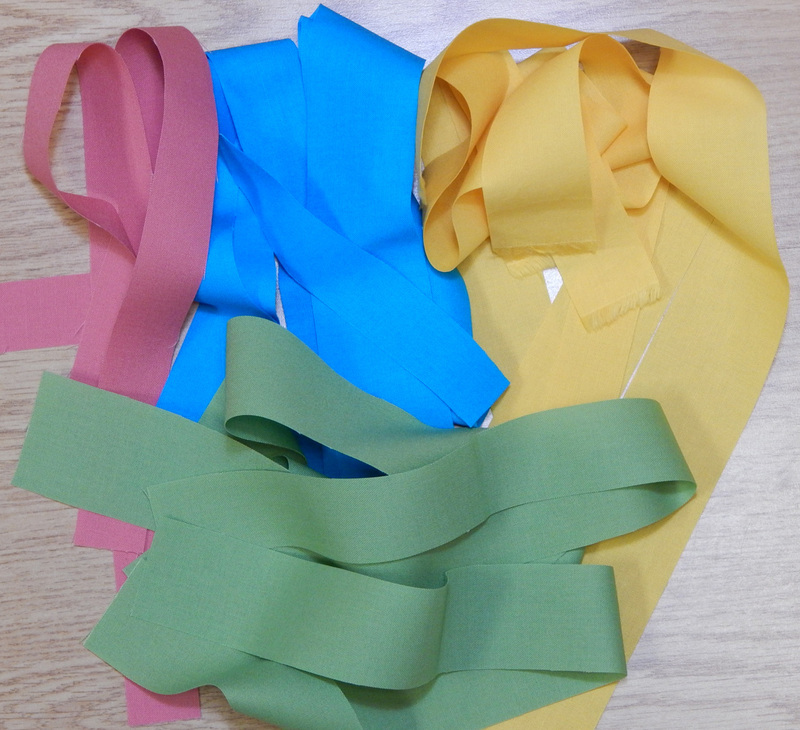 I cut a variety of widths from each solid color. I had NO idea what I was going to do with these blocks once I got them modified; I just liked cutting them up and inserting strips–it takes very little to entertain some of us 😉 Then I remembered John Cage’s “prepared piano”. So I called these “prepared fabrics”. 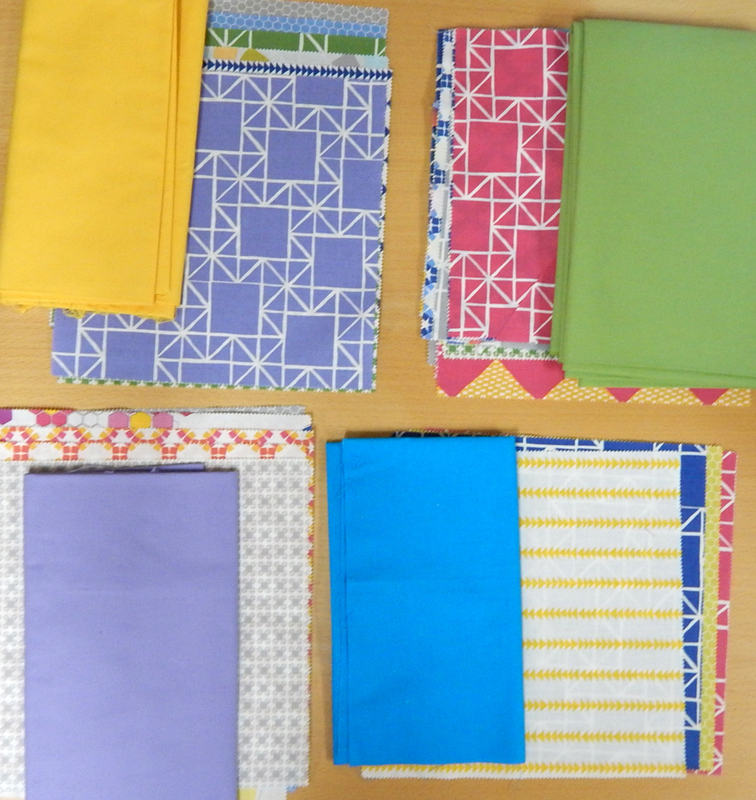 When I looked at my “prepared fabrics” together, it was apparent I wasn’t going to just sew them together along the edges (for several reasons)! Option #1. I’ve always loved concentric blocks, and alternating them like this produces a nice design easily. Option #2. Concentric blocks off-center are even better! Option #3. Flying geese are always a lively design element, and I just bought a special ruler for trimming! Option #4: I haven’t done anything with gentle curves for a while. These look like flags to me. My Modern Sampler top is ready for quilting! Then, for good measure, I put together the batik blocks from a swap I was in several years ago and sent that top off to be quilted, as well. Yes, the sashing DOES vary a bit, because the blocks do. That’s the way it goes with a block swap. 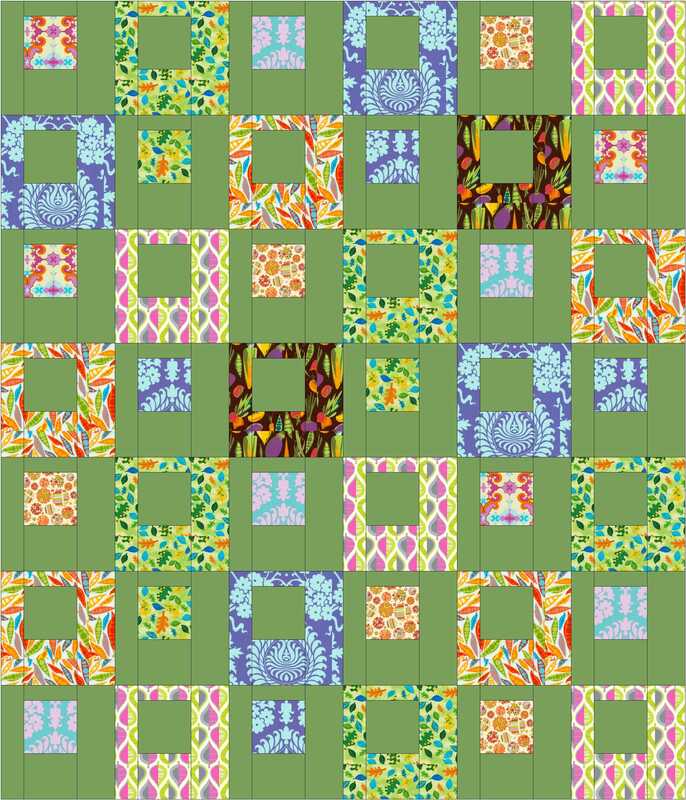 I love the variety of the blocks and, of course, the batik fabrics. I’m sending this to Aunt Marti’s UFO challenge, which helps keep me motivated. What are you up to? After finishing the blocks for my modern sampler, I ordered several shades of Essex linen/cotton blend to consider for the background. I know I said I’d never use linen again after the last struggle, but I’ve learned several things since. So, if you’re thinking of using linen in your quilts for its nice texture, read my tips at the end of this post. 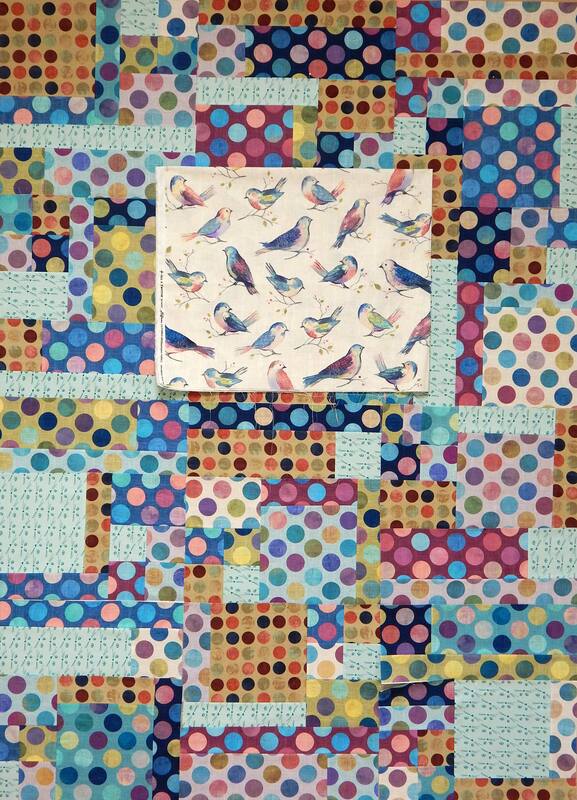 Here I’m trying various layouts on two different potential background fabrics. I hung the ironed fabric and pinned the blocks to it, trying out various layouts and different colors of background fabric. I decided I liked the natural background better than they gray. Then I took it all down and made a rectangle on my design “wall”, outlining the approximate finished size with blue painter’s tape. –The “linen” of the Essex brand actually is a linen/cotton blend, so it has a nice texture but is less wrinkle-prone and tighter woven than the linen I used previously. –Pre-wash the linen blend, even if you don’t pre-wash anything else. 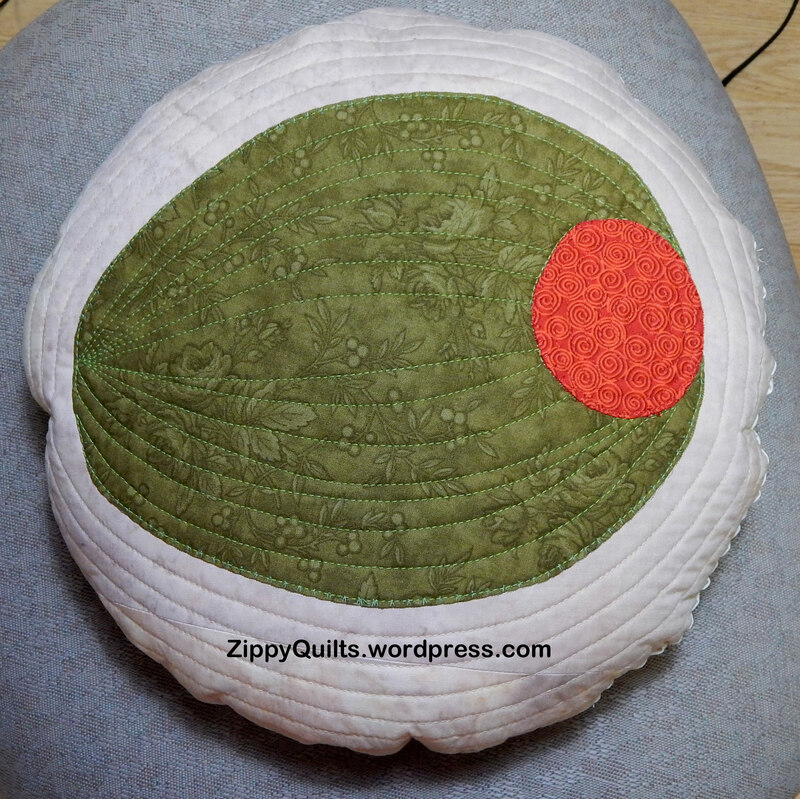 Wash in warm water and dry on warm so it will get its shrinking done and be more dense and stable. –Before you pre-wash, serge or zig-zag the raw edges together to prevent fraying! This worked great and “wasted” only about 1/4″ on each raw edge, much less than would have frayed. And there was no mess of threads in the washing machine. 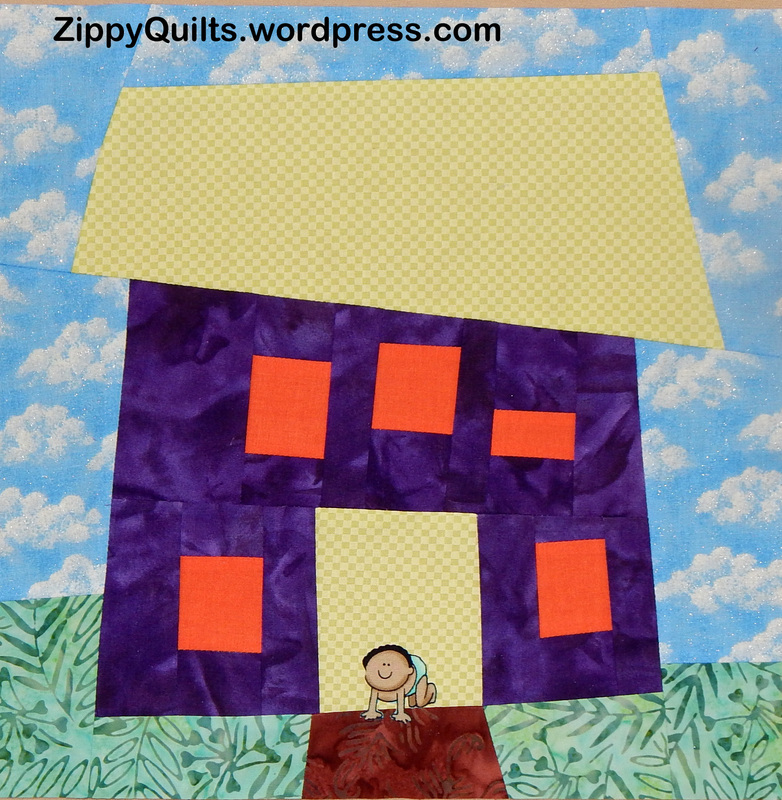 How have you done with using fabrics other than quilting cotton in quilts? For some time I’ve been meaning to add to my blog with a gallery of projects for each of the past several years. I’ve been held up in part by the variable quality of my photography over the years, but I’ve decided to just start anyway. Here are some projects from 2013. Well! That’s it for special projects from 2013. 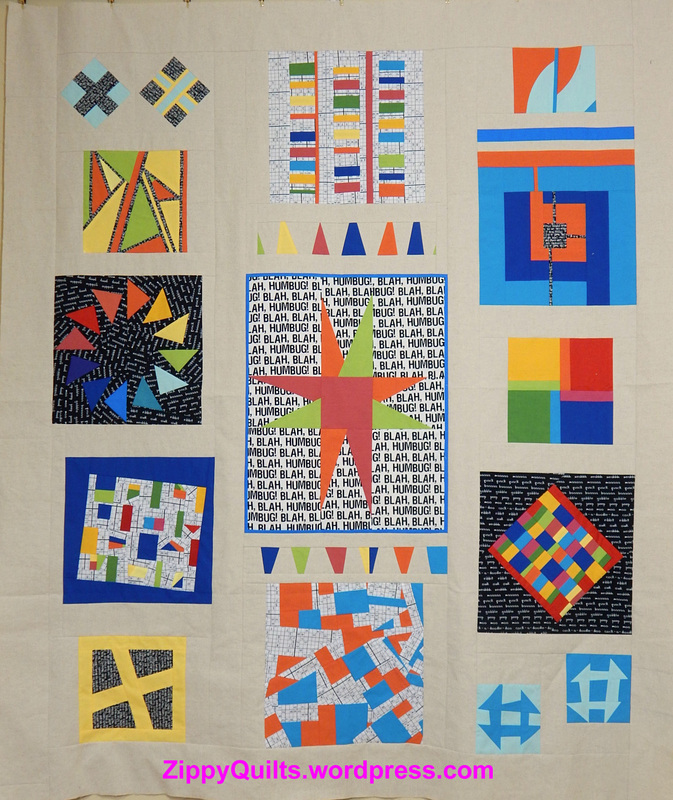 The actual quilts from 2013 are up next–more to come!